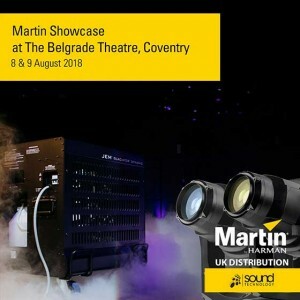 UK – Sound Technology Ltd, UK distributor of Martin by Harman, is holding two showcase days at the Belgrade Theatre in Coventry on the 8th and 9th August. The company will be focusing on the the now-shipping MAC Encore Wash CLD and WRM, the MAC Encore Performance CLD and WRM, and the new JEM Glaciator Dynamic low-fog system. MAC Viper, Quantum, Aura and RUSH Series will also be on display. Sessions run from 10:30 to 13:00 and 14:00 to 16:30 on both days. The events are open to everyone: LDs, technical managers, hire and production companies, resellers and anyone with an interest in Martin lighting. MAC Encore is a family of full-featured, record-breaking low weight, LED moving heads that deliver levels of light quality and consistent performance never seen before in LED-based stage lighting units. Designed to produce premium white light in two dedicated colour temperature variants for a wide variety of applications where critical lighting is required, MAC Encore is the whisper-silent benchmark, when quality of light, silent operation and tour-proven sturdiness are key to the performance. The JEM Glaciator Dynamic represents the most significant upgrade to the industry-leading JEM Glaciator series in more than a decade. Thanks to a completely re-imagined design, Glaciator Dynamic is smaller, quieter, and capable of operating in more locations, representing the ultimate all-in-one solution for generating low-lying fog in any venue, without the need for external fans, industrial gas tanks or ice. It was built with ultra-quiet operation in mind, delivering lower ambient noise for intimate theatrical productions.